I saw that one, started at $1400, now $1350. Not sure if this guy is a dealer or what, but I doubt it. Since it lists at $1599, not bad, but not my color. I'm curious as to why he's discounting a new boat. Looked a bit sketchy to mee to at first, maybe they fell off a truck. Saw a recent spec. on the company website, for the SS127, 69# hull wt. , 85# without the seat, 94# with the seat. So now manufacturers are basing their base wt. on just the hull out of the mold?? So that means there is 15+# of hatches, hardware, tracks, etc. So this 12ft. boat with the seat in place, which is what most anglers will have, is just short of 100# sliding off the roof or out of the Pick up? That's pretty disappointing. I agree Sailor... the manufacturers are trying to cram everything they can on/in their kayaks and the weight keeps going up, up, up. It seems that its becoming a trailer required hobby. Seeing Hobie die-hards posting about the PA's beug just to heavy even for a cart. The new and improved kayaker want's high chair seating and the ability to stand and walk around on their kayak, and does not take into consideration how well a kayak paddles, or want to take a little time to learn how to balance. That's why I like the W700. You get high seating, good paddling and standability at 80 pounds. The other thing most paddlers don't realize, is that the capacity rating includes the wt. of the boat. Without all the annoying bells and whistles to worry about. 80 pounds is heavy in my book... for years I had a really nice paddle craft the ScupperPro that was 15+ feet and weight 55 pounds. Did you do a lot of standing in the Scupper, krash? Nope... it was tricky but possible, if it had a flat floor like the Tridant's it would have been easier, but also I'm sure design wise the shape of te foot wells added structural integrty. That new version made by Swell has some videos of guys standing in them. Saw a post from pro-staffer Greg Timmer, aka. LT. FireDog, with a Bonafide Hondo Orange SS127 on his roof racks heading Southbound towards Pompano Bch. where it will be 4th place prize for the upcoming Extreme Kayak Fishing Summer Slam II Saturday August 25th. They have some pretty good prizes in that tournament. For sure,, the guy running it has done a good job for a couple years now and gets good sponsorship... a lot of kayakers show up every time. There seems to be a pretty good following of off-shore fishing yaker's, and the Extreme series is big. 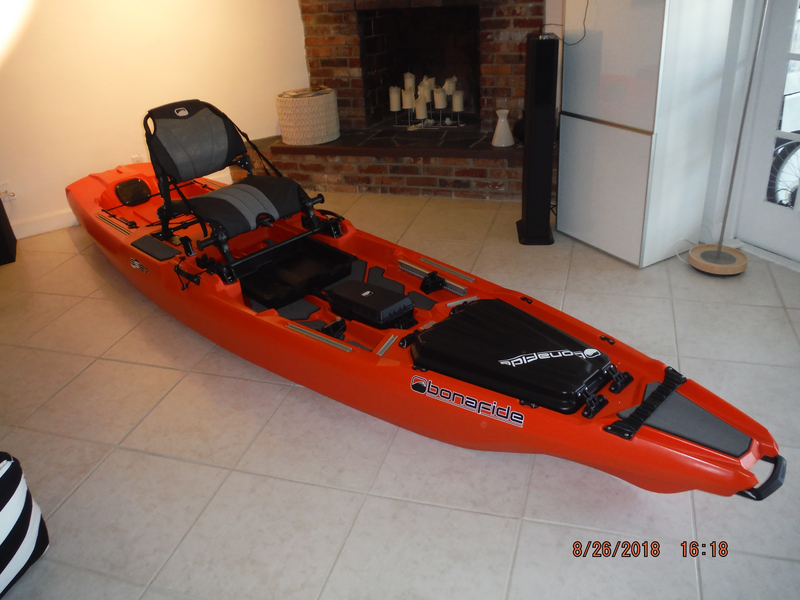 This Kayak is brand new, never used, won in a kayak fishing tournament. Kayak includes registration forms, but did not come with a paddle or any other accessories.